Like many great Muslim leaders, the late King Abdullah of Saudi Arabia placed a strong emphasis on the development of science and scholarship. He was aware of the magnificent accomplishments of early Muslim scientists and mathematicians and of the important role that the early Houses of Wisdom had played in the development of scholarship in the Islamic world. He was determined to play a strong role in the development of science and scholarship in the modern world. In 2005, King Abdullah stood on the shores of the Red Sea in the village of Thuwal, north of Jeddah, and declared that he will establish a world class university of science and technology on that spot. A year later, at the ground-breaking ceremony of the King Abdullah University of Science & Technology (KAUST), he said, “As a new House of Wisdom, the University shall be a beacon for peace, hope and reconciliation”. He also said that a component of the university will be an interactive museum that celebrates the contributions of Muslim scholars to science and technology during the first Golden Age of Islam, from 650 to 1650. The company that currently operates the Bahrain Science Centre, and for which I work, MTE Studios, was contracted to conceptualize, design, launch this new interactive museum on the KAUST campus. My task was to do the background research, create the storyline and write the contents for all the posters, exhibit labels and multi-media and touch screen interactive in the museum. The ‘Museum of Science & Technology in Islam’ at KAUST was completed within two years and, for nine months, I was the on-site adviser to the Director. MTE Studios also played a key role in the opening ceremony of KAUST. Shortly before this event, the King announced that he wanted to have a ‘time tunnel’ made that summarized the contributions of Muslim scholars, ancient and modern, to science and technology. The idea was that the VVIPs would stroll down this tunnel on their way to the opening. When this auspicious event took place on the 23rd September 2009, the VVIPs read a text written by MTE Studios staff. 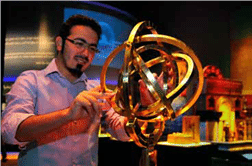 The Museum of Science and Technology in Islam at KAUST has been a great success. It is a ‘must-see’ destination for all visitors to the university and is also used regularly by staff and students. The different interactive clusters cover topics as varied as astronomy, cosmology, navigation, mathematics, cryptography, chemistry, physics, geology, architecture, engineering and biology. There are also interactive displays on topics such as ‘Why did Islamic science flourish?’, how to decipher Al-Kindi’s codes, the use of levers, offset cams, rocker arms and pistons in early water-raising machines, an Islamic science ‘Hall of Fame’, and even a quiz to test your knowledge. If you ever have a chance to visit the KAUST campus, do pop into the museum and witness how King Abdullah’s university has become a modern ‘House of Wisdom’. If you can’t visit KAUST, visit the museum online at www.kaust.edu.sa. You will find it enthralling! Next articleGroin hernia – How to manage?